Perhaps the fastest growing segment of the marine industry is the kayak. Both as the oldest and newest addition to the fishing scene, these craft are increasing popular with anglers. The first visitors to the North American continent came by way of the Bering Strait either by dog sled or kayak. Those craft were nothing more than animal skins stretched over a wooden frame. They were a fry cry from the modern materials of today’s craft. The early kayaks were to gather meat and fish for survival. Today anglers fish from them but also engage in the increasingly popular fishing contests. A couple of weeks ago over 100 kayakers gathered at the Kentucky Dam Village near Gilbertsville, KY to complete for total cash prizes of over $11,000 and merchandise prizes from event sponsors. The event is the second of a series of 5-qualifying events being held across the U.S. and Canada. More details are available at http://www.hobiefishingworlds.com. 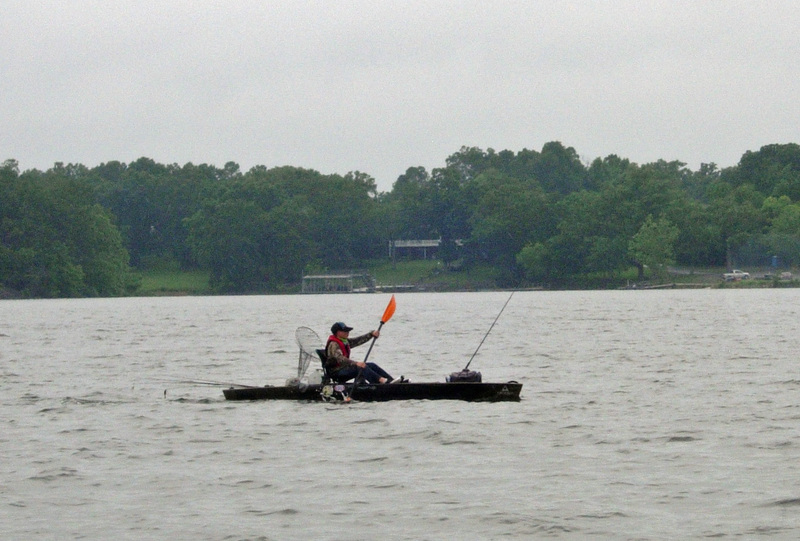 The contestants have a chance to fish both Kentucky and Barkley Lakes. The event is a Catch, Photo and Release format. Each angler records his catch by placing it on a Bump board that has inches and fractions marked on it. He places a token given to him at registration on the fish to verify his catch. He photographs the fish with either an iPhone or point and shoot camera and the fish released. If using an iPhone, the image is immediately sent to contest headquarters via iAngler.com, an online service that records the catch and keeps a up to the minute status of each angler. The top three fish of each angler counts toward his/her final score. First place in the adult division wins not only $3,500 but also is entitled to fish in the 2016 Hobie Fishing Worlds Championship in Lafourche Parish, LA on December 4-11. He also receives an all-expense paid trip to the event. Second place also qualifies for the Championship and a check for $2,300. Third place gets a check for $1,500. The top 5 anglers receive an invitation to the Tournament of Champions held in November on Lake Fork, TX. Is it time to kick the cobwebs out of you favorite hunting bow? Every year we all hear stories of the buck that got away because of equipment failure. But it is one part of hunting failure that can be avoided with a little effort and common sense. By doing the maintenance early, you can work with it longer and really be prepared for the hunting season in the fall. The purpose of maintenance is to ensure that you have a bow that will launch the arrow that will have good smooth, stable flight and accurate results at the target. Generally speaking, good flight will have good results. Begin by placing the bow on a table or in a bow vice with a white cotton cloth. The white cloth helps when if you have to look for a dropped screw or other small part. Examine the bow beginning at one end and working toward the other. Make note of any unusual wear of a part of the bow. Look for dirty wheels, frayed string or cable, loose arrow rest, loose nocking point or peep site, or any broken parts. After the initial inspection, look at your notes and order or purchase the parts you are going to need to fix or replace these parts. If it has been a year or more since you replaced the cables or string, you will probably need to do it again now. 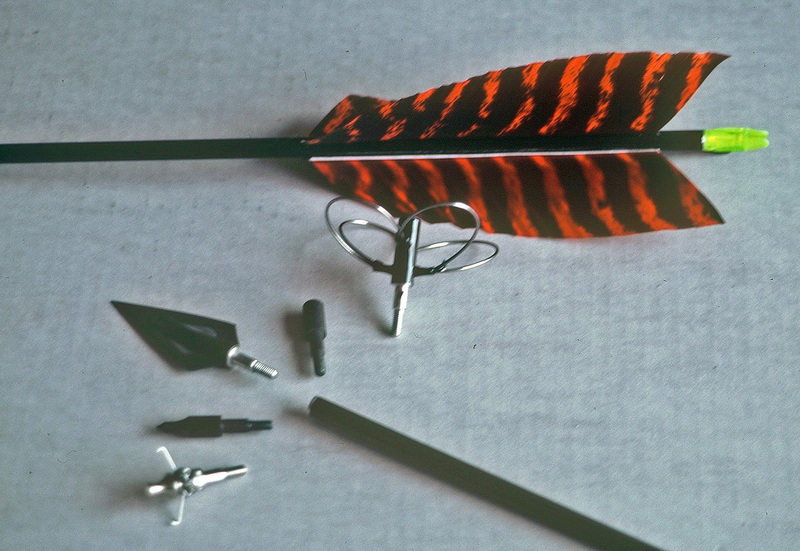 Unless you have replaced a cable or bowstring on your bow previously, it is probably a good idea to have the pro at your archery shop take care of it. He has the equipment to do so without throwing your wheels out or alignment. Remember that a compound bow is under tension all the time. When you release that tension, the wheels move as do the limbs, cables and string. Getting everything back together again can be a bit tricky. While the bow is apart, check the wheel bearings and axles. Make sure they move freely. Pull the axles and lube them as a preventative measure. It is also a good time to lube the limb bolts. Once these parts are taken care of you can do the rest of the maintenance yourself. Check the tiller. The tiller is the distance between the base of the limb, where it enter the limb pocket, and the bowstring. If you shoot a release, the tiller distance for the bottom and top limbs should be the same. Some archers prefer a slightly longer distance at the top limb. But, never more than 1/8th inch. The advantage to always having the limbs at equal tiller is that if there is a difference, you know that something moved and should be checked. Next check the synchronization of the wheels. For accuracy, the wheels should both turn at the same time. Have someone draw the bow while you check the turning over of the wheels. If they are not turning over together, check your owner’s manual or with archery pro-shop to see how to get them back in alignment. Examine the condition of the arrow rest. If it shows signs of unusual wear or is broken, it should be replaced. If it has adjustments for tension, now is the time to work with it. Do so slowly so as not to over adjust it. The instruction sheets that come with many rests, give information on adjustment and fine tuning. Otherwise seek advice from a pro. Once you are satisfied with the rest, it is time to install nocking points and peep sights. The location of the nocking point is dependent on the type of rest. Shoot‑through models work better with the nocking point at one angle while plunger models and launchers require higher nocking points. To adjust the location of nocking points, peep sights and kisser buttons requires the assistance of another person. The owner of the bow draws it with the release and arrow that he plans to use later. The other person, adjust the points, peep and kisser. Once the location has been ascertained, they are then installed according to the manufacturer’s instructions. Finally, check the bowsight for loose or broken parts. Repair or replace as necessary. Wipe down the bow with a soft cotton cloth and you are ready to take to the field. By paying attention to the details of bow maintenance, you are prepared to take to the field fully confident that it will perform satisfactorily. Practice with it and periodically check it out during the season to make sure nothing has changed or broken. Throughout the Mississippi River drainage, catfish seclude themselves in root wads, submerged brush, deep holes and bayous. Ever since man arrived on the scene, the cat has been a primary source of food and sport. Catfish are probably the most popular single species of fish for eating and catching. Almost every angler has a theory on what bait to use as well as where to find the big ones. Most towns have favorite locations for a fish fry, be it a restaurant, church social, civic function or someone’s backyard. The catfish is king. But, what about the angler who wants to catch his own catfish? Williamson county and southern Illinois are the places for him. The large lakes of The Crab Orchard National Wildlife Refuge and Lake of Egypt have excellent populations of catfish. It is not that people do not fish for catfish. It is just that there are just so many fish in these fertile waters. Of the catfish species mostly anglers pursue mostly channels and flatheads. 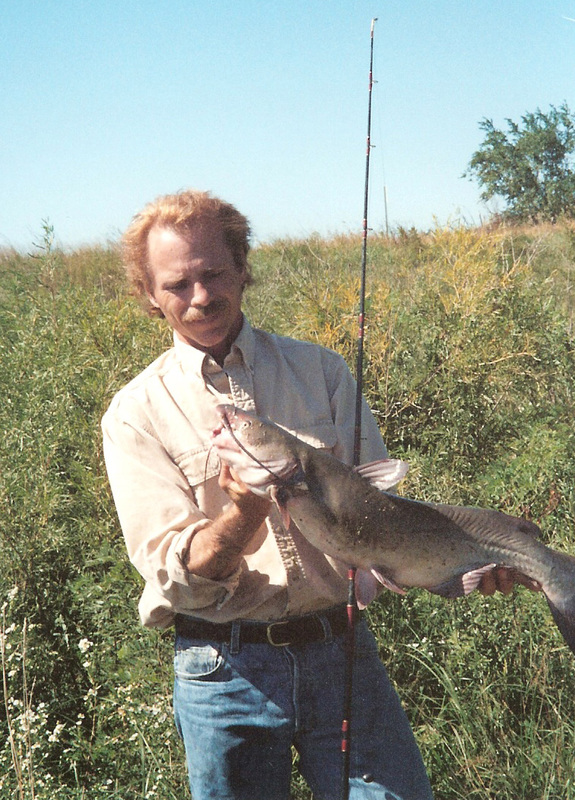 All area lakes are home to both of these species with Channel catfish readily added to many area ponds. The channel catfish is probably the most popular with anglers. Channels seek faster flowing and cleaner water with sand, gravel or rock bottoms. Catfish anglers are usually the most laid back of fishermen. They tend to prefer a leisurely time. Their rigs are simple with a weight and hook on a line that cast into the probable location of some fish. The rod is propped on a forked stick sunk into the bank. There are other variations used from boats and shore. But the basic is the same. Bait used for catfish can be alive or dead and can range from minnows to leeches, crayfish, catalpa worms, leaf worms, red worms, frogs and cut bait. More sophisticated catfish anglers have other patterns to fish. One of these, popular on small rivers and streams during the summer, an angler wades and fish live bait. This involves fishing live bait below a slip bobber and allowing it to drift downstream over the larger holes, washouts, undercut banks and beneath brush piles or other dark hideouts. The idea is to present a natural presentation of the bait by allowing the current to drift the bait in a natural way. The bait is set so that it floats just a few inches off the bottom much the same as any other food source. Popular baits for this kind of fishing are grasshoppers, night crawlers and crayfish. During periods of overcast or drizzle, catfish cruise flats in search of food much as they would at night. At this time one can employ a three-way rig. You attach the line going to the rod to one of the swivels. The second goes to a drop line of about 8-inches that has a heavy sinker on it. The third swivel attaches to a line of about 3-foot length with a hook at the end. The float keeps the live bait, either minnow or leech, in a natural presentation. Going back to the more leisurely approach to catfishing, one need only take a look at jug fishing and trot lining. Jug fishing is best in water with slow or no current with little or no snags under the surface. Bait suspends below a plastic milk jug and allowed to float free. A large number of jugs are usually used. The angler sits back to wait for a jug to take off in a direction that is different from the rest. Trot lines on the other hand are a line with a series of baited hooks tied in at intervals along its length. The snells are at varying lengths and baited with cut bait. Varying lengths of snells cover the water at all levels from the bottom to the surface with baited hooks. Anglers usually tie the line along the shoreline for easy access. Sometimes they will go from shore to midstream. Usually left overnight, or for several hours, then the angler retrieves the line and removes the fish. Catfish are a marvelous fish for both sport and eating. They can be as finicky as any game fish and yet do not require a lot of expensive tackle or boats to pursue. Catfish are king anywhere they are found. This is a good time to do a little ground pounding for catfish at Rend Lake in southern Illinois. It was after the spawn was over but the action was no less. Post spawn catfish are still healthy eaters and constantly on the search for an easy meal. They are also one of the most popular sport fish available throughout the Midwest. 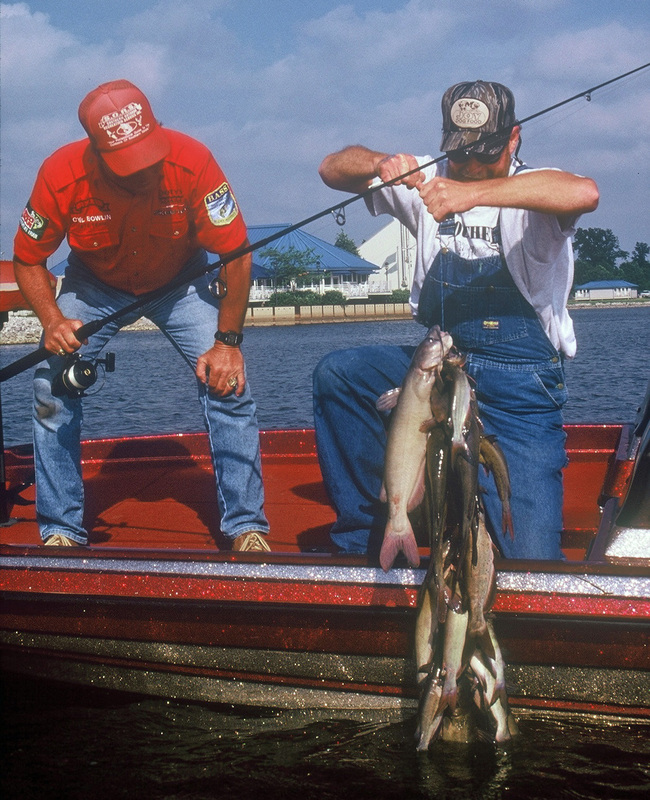 Each spring, the catfishermen prowl the shores of Rend Lake in search of the spawning catfish so prolific in this lake. All seem to enjoy the same success because the fish are on the rocks. But, catfish action does not end with the spawn. Biologists tell us that catfish are most active from sunset to sunrise. Our fathers knew this and fished mostly at night. Another gem of wisdom from biologists is that they are most often in shallow water near standing and downed timber. Channel catfish hang out near snags about 73 percent of the time and preferably in shallows. By summer the catfish are mostly in the shallower southern arms of a lake. During fall and winter they use the middle and southeastern arms of lakes. The conclusion is that one should fish the shallower arms of an impoundment such as Rend Lake on the warmer days. Cats move to the shore when water temperatures reach the middle to upper sixties. They spawn in earnest when the water reaches 72 degrees. The biologists recommend fishing in water 2 feet or less in depth and near timber in the shallower head-ends of coves. Rend Lake is a large Corps of Engineers impoundment in south-central Illinois on Interstate 57 at Exit 77. The lake spreads over part of Franklin and Jefferson counties about five hours south of Chicago. The 18,000-plus acres of water with its 160 miles of shoreline provide some excellent catfish habitat. This comes primarily in the form of rock and rips rap areas with flooded timber. This structure and the flooded roadbeds attract catfish in the early summer as they mate lay eggs and guard the nest while the young mature. Fishing for spawning cats is simple. Move slowly along the shoreline casting to likely looking spots. In terms of tackle, all one needs are good sharp hooks, a float, small pieces of lead and a can of worms. As the season move along, the fish may move a little further out, but not much, until they move out to the deeper water in late June or early July, after the young are on their own. The mistake many anglers make is in using hooks that are too large. A number 4 hook that is stout and sharp will do very nicely. Skewer a nightcrawler onto the hook and you are in business. By using ball swivels about 12 to 18 inches above the hook the line prevents the line breaking as a hooked fish twists and rolls. As they roll and twist, the line can become frayed and break. With the use of a ball swivel, the lower portion of the line can twist with the fish and not have any effect on the main line. Channel catfish feed by smell and a small piece of worm is all you need to catch any size fish. 12-pound line that matches the color of the water is a good choice. The float is placed 2 ½ to 3 feet above the bait, depending upon the water depth. The small sinker placed about 6 inches above the bait will keep the float upright and the bait just above the bottom of the lake. Use only enough weight to keep the float upright. Catfishing is great fun and a good source of fish for the freezer. For information about boat rentals, accommodations, bait, guide service and restaurant facilities contact Rend Lake Resort at 1-800-633-3341.